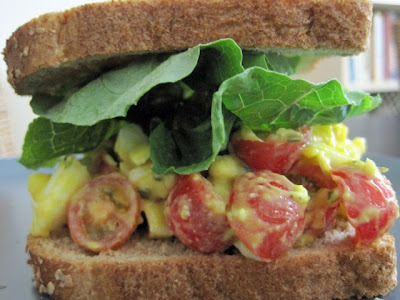 This weekend I think I perfected the art of making a yummy egg salad sandwich, with way less fat and calories than usual. Free-range, organic-fed eggs are a staple for me since I don't really like to eat a whole lot of meat but still need a lot of protein to fuel my physical activities. I hard-boil about 6 every Sunday, and use them either for breakfast or for a quick snack. I like my eggs a little overcooked, so I let them boil for a good 10 minutes. Then I diced two up in a medium bowl - and threw in some pickle relish with mustard, salt and pepper (to taste). I completely left out the mayo in favor of the healthier ingredients. 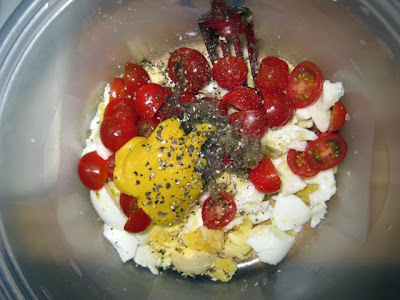 Then I halved ripe, sweet cherry tomatoes for an extra veggie kick. The last step was to spread my concoction onto whole wheat toast and layer with crisp romaine leaves. The result: it was divine.